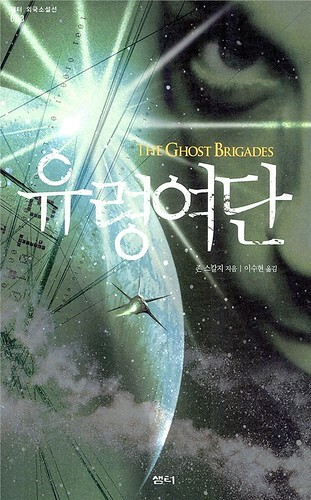 The one on the left is the Romanian version of Old Man’s War, which took a long and arduous path to publication but finally made it into print this last week; the one on the right is the Korean-language version of The Ghost Brigades, which has been out for some time, apparently (I was sent it by my Korean translator, who was asking me a question about The Last Colony, which he’s currently prepping). Both are handsome-looking covers, and quite green, I have to say, keeping with the soldiers in question. 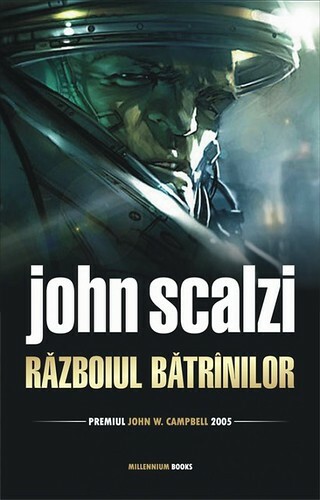 And the way I have them arranged, it looks like the starburst from the Korean cover is causing lens flare on the Romanian cover. It’s just a coincidence, I’m sure. 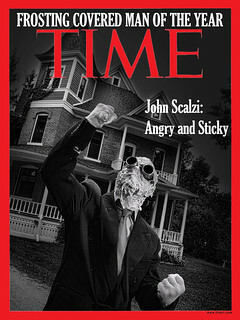 Yesterday’s short outage notwithstanding, if you want to send me an e-mail and you want me to actually see it, the very best place to send it is to my “john@scalzi.com” address and not to any other service I might be on, including Facebook. I don’t check in to every social service I’m a part of on a regular basis; for example, I check in to Goodreads maybe once a month. If you post an e-mail to one of those social services, I might not see it for days or weeks. Also, on the various services I’m on, the e-mail function tends to feel last minute and kludgy, and doesn’t sufficiently archive or do other things civilized e-mail should do, so I basically dislike using those services for anything than the most informal of messages. So, if you’re on Facebook or whatever and just want to send a short, quick “hello,” that’s fine, but if you have something serious to ask me, sending it to “john@scalzi.com” is the way to go. I’ll note here again that because of the volume of e-mail I get (it’s a lot, even without the spam), I don’t always respond to every e-mail and sometimes an e-mail gets past me. If you were hoping or expecting a response from me and didn’t get one, after a week or so, just send a follow-up. It’s the smart thing to do. METAtropolis Out in Germany + Sequel News! If you happen to be in Germany, or, really, any German-speaking country, today is the release date of the German version of METAtropolis. Look how bright and shiny it is! You just want to go up to it and hug it. Go and buy seven. I’m pleased to announce that On November 16th, Audible.com will release METAtropolis: Cascadia. 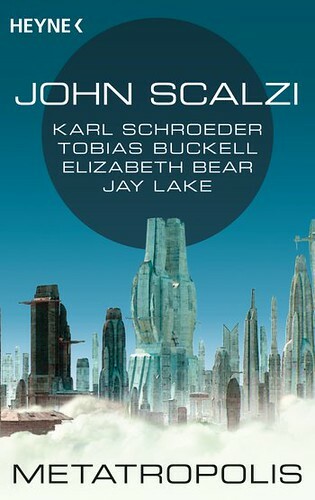 This is the sequel to METAtropolis, was nominated for both the Hugo Award and the Audie Award (the top honor in the audiobook industry), as well as being published in print by both Subterranean Press and Tor. This project was edited by me, with work from five other very fine writers. The intention was to focus on just one of the regions covered in the original METAtropolis. This audio anthology deals with the Pacific Northwest, and the successors to Cascadiopolis, subject of my story in the original volume, “In the Forests of the Night.” My own story is a direct sequel, some forty years after the first piece, which explores the direct consequences of the fate of Cascadiopolis. The others take different directions into this same future. Very, very cool, and with an excellent line-up of writers. I wasn’t able to join in this time around due to other commitments, but as you can clearly see, they did just fine without me. I’ll be picking up my copy in November, because I’m looking forward to hearing how this world continues. It’s going to be awesome. When in doubt, simplify. This is a piece of advice that has general application but particularly works for writers, who can get lost in the thickets of their own words and ideas. 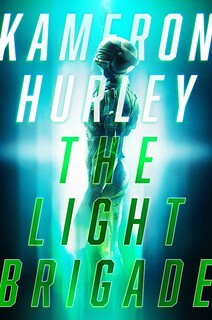 Just ask Matthew J. Kirby, whose middle-grade novel The Clockwork Three (which just received a coveted starred review from Publishers Weekly) has it roots in a series of ideas, but which came to life when Kirby realized that the gears of his story meshed together on a more fundamental level. Kirby puts it all together below. Before I began writing The Clockwork Three, I thought I had three big ideas. I thought I had three separate books for young readers, stories that had nothing at all to do with each other. First, there was the story of an Italian street musician. His name was Giuseppe, and he was inspired by a real boy the New York Times of 1873 named “Joseph.” During the 19th century it was a fairly common practice to buy or kidnap children from Italy and ship them off to Paris, London, or New York City, where they were forced to play music and beg on the streets for money. Many of these children endured years of physical and emotional abuse at the hands of their padroni, or masters. According to his later testimony, Joseph was regularly beaten, bound, starved, and he had a scar on his ear where his padrone, a man named Vincenzo Motto, had bitten him. Motto threatened to kill Joseph if the boy ever tried to escape, but one night Joseph did just that. He fled into Central Park, where he was eventually found by a park-keeper and taken to a woman who ran one of the cottages in the park (a building now known as the Dairy). This woman looked after Joseph, and he eventually took the stand to testify against the man who had held him captive. After reading this story, I knew I wanted to tell it in some way. For my second big idea, I wanted to tell a mystery story, a secret history for young readers. I knew it would involve a colorful Madame Blavatsky type figure, and Spiritualism, and something hidden. I had an idea of the setting in which the story would take place, a grand 19th century hotel, and I knew the main character would be a young maid working in that hotel. My third idea was for a science-fantasy in which an apprentice mechanician violates the edicts of his guild and attempts to create an artificial man. Looking back, I know I was overly ambitious, but in my hubris, I wanted to write a Viriconium for middle grade readers, something that would cause them to wonder and think about the technology they are growing up with and taking for granted. It’s an idea I may still return to if I ever feel able to take on something so large, which won’t be anytime soon. So I had these three big ideas, and I was pursuing them all as independent stories. But at some point, I realized I didn’t have three big ideas. I had one big idea for a story that would bring all three characters and stories together. The stories of Giuseppe and the maid in the hotel fit naturally in terms of setting. The story of the ambitious mechanician went through the greatest changes, but he soon became an apprentice clockmaker, and the automaton he creates, with the help of the other two characters, became the central metaphor of the novel. I know it was the right choice to bring them together. As soon as I began writing, it was as if the characters had wanted to meet and help each other all along. And as complicated as the plot is, I was able to write the majority of the book without an outline. Everything simply fit, page after page, scene after scene. The stories of Giuseppe, Frederick, and Hannah interlocked, like the turning gears of a clock, and they became The Clockwork Three. Read an excerpt (pdf link). Visit the book site, with a trailer and an interview. Visit the author’s blog.